There’s a small town in Pennsylvania named Emmaus. The town has just over 11,000 people living in just under 3 square miles. Emmaus is home to Rodale – the publishers of Organic Gardening magazine and many other fine magazines and books. Emmaus is about 9 miles, or about a 4 hour walk, from Bethlehem, PA. Traveling around Pennsylvania, you can find many towns named after places found in the Bible such as Emmaus, Bethlehem and Nazareth. Pennsylvania’s Emmaus draws its name from the 24th chapter of the Bible’s Gospel of Luke. Two of Jesus disciples have just left Jerusalem after the crucifixion of Jesus. They probably decided it was a good time to get out of the city before widespread persecution of Jesus’ followers commenced. They’re walking on the road to Emmaus. The tone at the beginning of the chapter is one of disappointment. They had hoped Jesus was the coming King who would rescue the Jews from the oppression of their enemies. Now the deliverer they had hoped for was dead and they were probably wanted fugitives. If they had businesses, those assets had probably been seized and even the safety of their families could be at risk. These men were full of worry and unsure of their futures when a stranger joined them on their walk. Not recognizing the man, they continued with their kvetching. The stranger turned out to be Jesus. Bible scholars disagree on exactly where Emmaus was, but we do know it was within easy walking distance from Jerusalem; the most likely distance is between 6 to 10 miles. There is no city by this name anywhere near Jerusalem today, although the geographic area is probably just outside the modern day city limits. Thinking about this, I wonder if maybe “the road to Emmaus” should be regarded as more a state of mind than a place. Despite all the time spent hearing Jesus’ teachings and receiving His promises, the disciples forgot all of that and instead chose to focus on their own doubts and fears as they walked along the road. They were so self focused they didn’t recognize their teacher walking alongside them. Imagine how ridiculous they must have felt when they finally realized who their traveling companion was; they even acknowledged their hearts were burning the entire time they were with him! Do you ever find yourself “walking to Emmaus”? We sometimes focus on and worry about what our eyes can see and we forget to lean on what our heart knows. It’s in times like these we need to remember some key scriptures. Psalm 77 verses 1-2 “I cried out to God for help; I cried out to God to hear me. When I was in distress, I sought the Lord; at night I stretched out untiring hands, and I would not be comforted.” and verses 13-15 “Your ways, God, are holy. What god is as great as our God? You are the God who performs miracles; you display your power among the peoples. With your mighty arm you redeemed your people, the descendants of Jacob and Joseph.” In Genesis 18:14, God asks Abraham “Is there anything too hard for God?” Of course the answer is “No”. 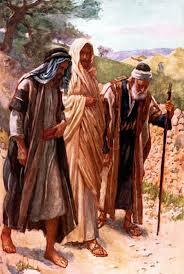 When you find yourself on that “road to Emmaus”, remember God’s words to Joshua “Have I not commanded you? Be strong and courageous. Do not be afraid; do not be discouraged, for the Lord your God will be with you wherever you go.” Joshua 1:9. Wherever you walk, you are never walking only for yourself, and you never walk alone! This entry was posted in Uncategorized and tagged Bethlehem, Bible, Depression, Disappointmrnt, Disciples, Emmaus, Genesis 18:14, Hopelessness, Israel, Jerusalem, Jesus, Joshua 1:9, Lonliness, Nazareth, Pennsylvania, Psalm 77, Rodale, Walking, Worry. Bookmark the permalink.